Subscribe to Erin's newsletter to stay connected. Erin has completed advanced CranioSacral Therapy training with Dr. Ron Wish at the Great River Craniosacral Therapy Institute. She also trains with Dr. Carol Phillips in the CranioSacral Therapy techniques of Dynamic Body Balancing and Myofascial Unwinding, focusing on pregnant women, infants and children. In addition Erin in a certified yoga teacher (200hr) from Yoga To The People in San Francisco, CA, and has completed yoga teacher trainings with Tari Prinster of Yoga4Cancer(y4c) and Ana Forest of Forest Yoga. Erin is an intuitive healer, bodyworker and guide. With compassion and focus she is able to tap into the natural rhythms of the body and assist them into deep harmony with one another. Erin has a passion for helping her clients align body, mind and spirt and release tension and trauma through gentle touch, connection to breath, imagery and dialoguing. Erin has a masters degree in public policy and has worked for humanitarian and women's rights organizations. She has experience working with various populations such as cancer survivors, international refugees, trauma and abuse survivors, those struggling with substance abuse, eating disorders and mental illness. Craniosacral Therapy is a gentle but profound healing form which assists the body's natural capacity for self repair. The therapist uses light touch to calm the nervous system, identify and release blockages in the body, uncover root causes of stress and pain, and bring harmony to the body, mind and spirit. It's subtle nature is surprisingly effective and gentle enough for infants, pregnant women, those with severe conditions and seniors. For more information on what you should expect from your first Craniosacral Therapy session click below. If you have ever enjoyed the scent of a rose, you’ve experienced the aromatic qualities of essential oils. These naturally occurring, volatile aromatic compounds are found in the seeds, bark, stems, roots, flowers, and other parts of plants. They can be both beautifully and powerfully fragrant. Essential oils give plants their distinctive smells, essential oils protect plants and play a role in plant pollination. In addition to their intrinsic benefits to plants and their beautiful fragrance, essential oils have long been used for cooking, skin-care, and health-care practices. AROMATIC— Essential oils that can be used aromatically. Diffusion is one of the most popular ways to enjoy the aromatic benefits of essential oils. TOPICAL— Essential oils that can be used topically, which means you can apply them directly on the skin or mix them with carrier oils or other personal care products. INTERNAL— Essential oils that can be used internally. You can add oils to beverages, take them in doTERRA Veggie Caps, take doTERRA essential oils supplements, or use them in your favorite recipes. Add to a spray bottle of water to clean tables, countertops, and other surfaces. Use to remove gum, glue, or any other sticky residues. Add to your favorite desserts or beverages for zesty flavor. Diffuse to purify air and create an uplifting, refreshing aromatic experience. Diffuse or add a few drops to your pillow or feet to prepare for a restful night’s sleep. Apply topically to help reduce the appearance of blemishes. Add a few drops to a warm bath to help soak away stress. Apply a few drops to the back of your neck to cool off. For a clearing, refreshing aroma, diffuse at night by your bedside. Rub on head and neck for a soothing sensation when feeling tense. Diffuse during meditation for a sense of relaxation and balance. Combine 1–2 drops with your facial cleanser or moisturizer for added cleansing properties, or apply to skin after shaving. Apply to fingernails and toenails to keep nails looking clean and healthy. Use as an effective surface cleaner. Add a few drops to shampoo or massage into the scalp. Add to toothpaste or swish with water for a quick and easy mouth rinse. Of the products that doTERRA offers, the supplements are an exciting, yet overwhelming option if you’re not sure where to start. All doTERRA supplements are bioavailable and made with essential oils, safe for internal use. While there is no complete replacement for a healthy diet and exercise program, today’s modern diet does not provide the nutrients we need to not only stay healthy, but also have energy and prevent premature aging. Enter the doTERRA Lifelong Vitality Pack. These are all supplements meant to be used on a daily basis in order to maintain a healthy lifestyle. Every day, our DNA and other cells are under attack from free radicals that damage them. Alpha CRS+ combats this, and stimulates overall cellular health. For this reason, Alpha CRS+ is also known as the cellular energy and longevity blend. Some of the nutrients included in the formula are coenzyme Q10 and acetyl-l-carnitine, which help the metabolic processes of the cell to give you more energy. There are also antioxidants like quercetin and alpha-lipoic acid that help combat oxidative stress and aging. Finally, a botanical extract of Ginko biloba helps support mental clarity and energy. This complex contains natural highly bioavailable vitamins, minerals, and trace elements in proportions that work hand-in-hand with your diet. (For example, vitamins A, C, and E, B, and D, and the minerals calcium, magnesium, and zinc.) Often, vitamins and minerals included in supplements can be difficult for our bodies to absorb. However, Microplex VMz solves the absorption issue by using a glycoprotein matrix to help the body absorb vitamins, and chelated minerals (meaning the mineral is bound to an amino acid). In essence, this process makes the supplement recognizable as food nutrients to our digestive systems. * Overall Microplex VMz supports healthy metabolism, digestion, immune function and cellular energy. xEO Mega takes care of your remaining nutritional needs with omega-3s (known as essential fatty acids), essential oils, and vitamins D and E. Fatty acids help support your joints, skin, and cardiovascular and brain health. The best sources of omega-3s are fatty fish and marine algae, which are not common in most diets and can be expensive. The molecularly filtered fish oil in xEO Mega supplies 300 mg of EPA and 300 mg of DHA per daily serving, and 55 mg of other omega-3s. It is also formulated with a blend of Clove, Frankincense, Thyme, Cumin, Wild Orange, Peppermint, Ginger, Caraway, & German Chamomile oils, that add antioxidant protection to the mix. Join with a “Wholesale Customer” membership. The membership gives you 25% off for a year. It is $35 or free if you start with a kit. There are no monthly fees. Join with as a “Wellness Advocate” membership. This option costs the same, also gives you a 25% discount but gives you the option to share oils with others to earn commission to pay for your monthly order, supplement your income or even become your new career! You are not required sell anything or buy again after your initial order. Although you'll probably want to! Starter Kits are the BEST way to start using doTERRA oils and products. Schedule a FREE consult with Erin to find out what kit is the best fit for you. Call Erin at 347-450-3681 or email at erin[at]erinoglesby.com. 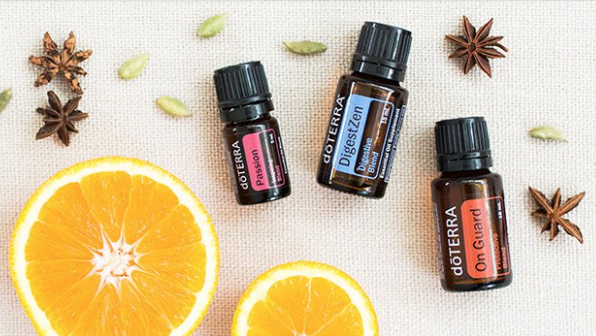 *For those who choose to purchase a doTERRA Essential Oil Kit, a discount will be applied to the packages depending on cost of EO kit. Speak with Erin for details on purchasing Essential Oil kits and for more information about packages. Insurance is not accepted, however you may request a receipt and use your flexible spending account. Craniosacral Therapy is a gentle, yet profound healing form which assists the body’s natural capacity for self repair, using light touch to calm the nervous system, identify and release blockages in the body, uncover root causes of stress and pain, and bring harmony to the body, mind and spirit. This 3-Day intensive workshop will give hands-on experience, teaching students basic CranioSacral techniques, and an understanding of the CranioSacral System. Students will also learn how to effectively use dōTERRA essential oils in CranioSacral treatments as well as for self-care as a healing practitioner. Craniosacral Therapy (CST) is a safe, natural form of hands-on healing that helps people heal and open as they release physical and emotional pain and suffering. CST is a potent alternative to allopathic medical care, as well as a deeply healing supplement to all conventional health care techniques. Learn how powerful your healing can truly be, with this effective, non-invasive modality proven to relieve pain without medication. Take our introductory Craniosacral Therapy Training program. This introductory course in Craniosacral Therapy and Essential Oils is for you if you are looking for an exciting healing journey or to expand your career as a healing practitioner. This three day workshop provides you with a practical and fun introduction to CST and essential oils. In this training you quickly begin using your healing hands with gentleness, intuition, and technical accuracy. You also begin connecting with the wavelike craniosacral rhythm and learn over 20 CST techniques that you can immediately put into practice to release structural and energetic blocks. The goal of the intro workshop is to give students an understanding of the basics of CST, to teach students how to begin helping their clients resolve pain, release emotional blocks, and feel greater balance using CST. Using Essential oils in a healing treatment can amplify the benefits of healing, by providing deep relaxation, a calming effect on the nervous system, tension release and assisting in the clearing energetic/emotional blocks. Essential oils are extracted directly from the bark, flower fruit, leaves, nut, resin or root of a plant or tree, and just one drop can provide the amazing health benefits that each oil provides. Used medicinally for thousands of years, the potency behind these best essential oils is their ability to support your natural healing systems. Each oil has a physical health benefit, but also emotional and spiritual benefits as well. They are made from the earth and as are we, so we use this powerful plant medicine to heal and grow in to our highest selves. All participants will received a kit with 8 5ml doterra essential oils (Wild Orange, Peppermint, Lavender, Balance, Deep Blue, Aromatouch, On Guard and Melaleuca) and a bottle of Fractionated Coconut Oil for dilution. This kit is a $100 value. Whether you are brand new to healing work or using CST as an addition to your current healing practice, you and your clients will be awed by the results. For massage and physical therapists, rolfers, and chiropractors whose bodies are wearing out from hard manual labor, the gentleness of CST can transform and prolong your careers. For acupuncturists and other natural practitioners who are looking for gentle and effective hands on healing techniques for nervous clients. For nurses, physicians, and psychotherapists seeking effective natural healing forms with virtually no negative side effects, this calm practice will rejuvenate you and deepen your patients’ healing. For lay people, the warm, supportive environment of our training program provides you with an ideal place to combine personal healing with a sacred inner journey. Please register and send payment for the course ASAP to ensure we have a space for you in the training. Cost: $250 US/ 1,850Q and includes doTERRA essential oil kit. Cost $650 and includes doTERRA essential oil kit. Thank you for your message. Erin will be in touch with a response as soon as possible*. Have a beautiful day! *If you do not receive a response within 2 days please feel free to email directly at erin[at]erinoglesby.com or call 559-392-3494.